Synonyms: The Badminton play of Ayano Hanesaki! Published: Jun 7, 2013 to ? Tachibana Kentarou is a high school badminton coach who has a lot more enthusiasm than some of the members of his very small team. One day, he meets the quiet-voiced student Hanesaki Ayano, who is effortlessly physically capable and experienced in badminton. He tries to recruit her, but she seems to have no interest in the sport at all. Due to a series of circumstances, she eventually ends up joining the team. Coach Tachibana is determined that with her on board, they'll be champions! 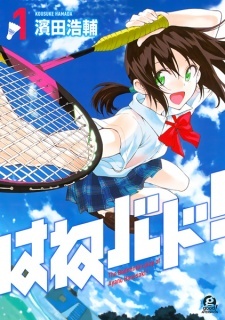 Do you like realistic/badminton manga with a ton of cute girls with an inspiring coach? This manga is for YOU! So far, up to chapter 34, this manga does not contain superpower abilities like those of Kuroko no Basuke (Emperor Eye or Zone...). Rather, this badminton is pretty realistic in terms of how real life skilled badminton players can do and how energy can affect their performance. This is something I was amazed and cherish because I appreciate the illustration of how an "actual" badminton game can be. For people who are concerned with the correlation of each game's length to chapter's length, it is definitely not like Yowamushi Pedal..., which is ridiculously ****ing long. Each game takes around 1~2 chapters or 3~5 chapters (depending on importance). For me, this is reasonable. Having read so much manga, the setup for Ayano as a manga character is extremely unique. I want to see the transformation fo Ayano. How does this compare to the anime?